Bubba sez he never gets into a battle of wits with an unarmed opponent…Trust me on this one: Faith is being sure of what you hope for and certain of what you do not see. Hebrews 11:1… When NASA first started sending up astronauts, they quickly discovered that ballpoint pens would not work in zero gravity. To combat this problem, NASA scientists spent a decade and $12 billion developing a pen that writes in zero gravity, upside down, on almost any surface including glass and at temperatures ranging from below freezing to over 300 C. The Russians used a pencil. Enjoy paying your taxes…On June 14 the Prairie du Chien Country Club hosted the 10th annual Campion Golf Outing. 140 golfers partook in the festivities, which started the evening before with a reception at Kabers Supper Club. Attendees included alumni from about a 30 year swath of graduating classes, former teachers and priests, parents and friends. The event was a 4 man scramble, and included a mulligan allotment. The contact for this event is Mark Peterson 68 (608) 326-6496. Missing the outing for the first time was Dan Caya 68, who passed away the week before after succumbing to cancer…Aaron: This is a request for prayers from the Campion Knights for the Rev. John Holbrook, S.J. '38, who is at Saint Camillus in Wauwatosa and is ill. Also there at Saint Camillus is the Rev. Robert Purcell, S.J. '38 and the Rev. Walter H. Halloran, S.J., '39, the Rev. John Scott, S.J., and the Rev. James Kramper, S.J., former teachers at Campion. I thought that these Knights and/or teachers could be added to the list. Rev. William J. Kelly, S.J. / Jesuit Community / Marquette University / P.O. Box 1881 / 1404 West Wisconsin Avenue / Milwaukee, WI 53201-1881 / Tel: (414) 288-5000 / Email: Kellysj@marquette.edu…Defining the word AMEN: The only part of a prayer that everyone knows…An older Jewish gentleman was on the operating table awaiting surgery and he insisted that his son, a renowned surgeon, perform the operation. As he was about to get the anesthesia he asked to speak to his son. "Yes, Dad, what is it?" "Don't be nervous, son; do your best and just remember, if it doesn't go well, if something happens to me ... your mother is going to come and live with you and your wife...."
Several days ago, I received an anonymous email message from a person I do not know. It is a copy of a letter that a father wrote to his four sons. The letter is a very strong statement concerning the current status of our country in terms of the terrorist situation. I consider it an important document that should be read by every American. I emailed the letter to the 600 or so men in my CHS file who use email. I have received about 35 responses. Four of these were very negative. One was a gentleman who counts a Muslim as his son in law. His sensitivity is understandable. A couple of them said that I should not start politicizing Campion Forever. One told me that I was a pro-Bush conservative and the letter is an abomination. This was in spite of the fact that the letter's author criticizes the President and his administration for ordering a halt to "profiling". Two of our grads asked me to take their names off of our mailing list. I did this with no apology. I had characterized the letter as apolitical. I believe that it is. It is above politics. Among the respondents, all but these few were greatly impressed with the man's words, stating that they would be passing it along to family and friends. A 1971 CHS grad, Joe Trad, wrote to tell us that he knows a man who has four sons by the same given names, and one of them was his best friend at Campion. Meanwhile, the author, heretofore unknown to me, emailed us that he was quite happy that I was distributing his thesis, probably alerted by the same Joe Trad. For you non-computer guys, please know that I will not short you on things that we consider of interest. Our modern day technological advances allow us many benefits, one of which is email. I sent the letter to the 600 brothers in less than 8 minutes at no cost. They were received in a matter of seconds. Should any of you non-computer gentleman like a copy of the letter, please send us a self-addressed, stamped (60¢) envelope and we will be happy to get one to you. Our address is in the masthead of this newsletter. The document is a bit too long to include in our regular publication. WASHINGTON, Jan. 16, 2003 - William J. McDonough (Campion '52), president of the Federal Reserve Bank of New York and the second most important person in the Federal Reserve System, after the chairman, said today that he would retire in July. The announcement caught many people within the financial industry by surprise, so there had been little speculation before today about possible successors. A courteous and even courtly banker, Mr. McDonough played a critical role in keeping the financial system afloat after the Sept. 11 attacks devastated much of the Wall Street financial center. But he may be remembered even more for his controversial role in averting the collapse in 1998 of Long-Term Capital Management, the huge hedge fund that ran up billions of dollars in debt it could not repay. Afraid that a collapse of Long-Term Capital might lead to a broader financial panic, Mr. McDonough corralled many of the company's biggest creditors—most of them major banks and investment banks—and persuaded them to rescue the fund by injecting $4 billion in fresh money. Many critics complained that the New York Fed's intervention had set an unwelcome precedent that would encourage other troubled institutions to look for official help in the future. But supporters said Mr. McDonough had helped avoid what could have been a serious setback to the financial system, and they noted that he had done it without using any public money. Mr. McDonough has been an important ally of Alan Greenspan, the Fed chairman, and Mr. Greenspan has relied on him heavily. Under Mr. Greenspan, Mr. McDonough has been the Fed's chief negotiator in international talks in Basel, Switzerland, on how to modernize the way banks manage and account for their risks. "I will greatly miss Bill McDonough's counsel and advice," Mr. Greenspan said in a written statement today. "After a decade of exemplary service to the Federal Reserve System, his retirement will leave a pronounced void." The New York Fed is unique among the 12 district banks that make up the Federal Reserve System. Because it is situated in the nation's financial center, the president of the New York Fed is a permanent member and vice chairman of the Federal Open Market Committee, which makes decisions about interest rates. Beyond conducting open-market operations that carry out monetary policy, the New York Fed also conducts large amounts of foreign exchange dealings and manages much of the Treasury's debt. Re: The Saga of Campion H.S. In the Summer edition of The Company, a letter from Jerry O'Leary described Campion H.S. as a Catholic reformatory. This is part of an ongoing debate that O'Leary and I have been arguing for more than 50 years, since our days at Prairie du Chien and then Spring Hill College. True, Campion was a reformatory, but not in the criminal justice sense. Jesuit schools are rightly renowned for reforming brash and cocky boys or shy and introverted boys into educated, thoughtful young men who know right from wrong; the exceptions being Voltaire, Castro, Jerry Brown, etc. When it came time, my three sons went to Georgetown Prep, and my daughter took Greek there with Fr. James Byrne. It was true of Prep—give us a boy and we will give you back a man—as it was of Campion. Hopefully, the tradition will be continued unabated by political correctness. Fr. Greg Lucey, President of Spring Hill College, is a Campion alumnus. During a 1971 visit with my family and me in Florida, he held my youngest son, Edmund Campion Walsh, then an infant, and assured my wife and me, that there would always be a bed for him at Campion H.S. But when the boy was ready for high school, Campion H.S. was no more. The physical plant had become part of the Wisconsin Correctional Institutions, as Paul Fox's photo in the Winter edition of The Company attests. So Camp headed instead to Prep. At a recent Spring Hill reunion, when reminded of his promise, Father Lucey replied that it was a good thing his promise hadn't been etched in stone. But the Campion H.S. saga lives on, Campion forever! Contrary to the allegations of friend O'Leary that it was the irate alumni who refused to fund Campion H.S. that did it in, other dynamics caused its passing in the 1970s. St. Edmund Campion, famous for his brag against the Queen, must be pleased with the ongoing controversy. Thank you for your very nice letter to me. The passage of Campion from the Catholic boarding schools of the country is something that I regret almost daily. I think that the motto that we used to see on the highway and in the literature: "Give Campion a boy and get back a man" was quite true. I, too, feel that I owe Campion a lot. It is odd that you should mention Easter vacation. It actually began my freshman year and was the response of the Jesuit community to the fact that some of the seniors that year, being subject to the draft, might have to go to Korea. For that reason, it was decided to give us some Easter vacation, which had not been a Campion tradition. You all may recall that in our July '04 newsletter I indicated that whereas we have been communicating with several men who we have had contained in our Florida JUG, we will stop all such communications with this issue. Even with this caveat, we have heard from only one of these brothers. It is quite discouraging to think that these guys have no interest in our work. We would rather assume that most of them are in that great Campion in the sky, or gravely ill and we have not been so notified. Follows: Our P & L statement for the year ending 6/30/04. STRATHAM NH — A Stratham man has been recognized for his work to save the Earth's ozone layer. Robert Wickham (Campion '58), a Stratham resident since the mid1980s, was one of nine people, and the only American, to receive the Stratospheric Ozone Protection Award at the Earth Technologies Forum in Washington. Wickham, who retired in 1995 from decades as an executive for companies that make fire extinguishers, is now putting the knowledge to work for global entities like the World Bank. "I've spent over 30 years in the fire-protection industry, and the work I'm doing now is more important than what I've done before because it's having an effect on the health and safety of the people of the Southern Hemisphere," he said. At the core of Wickham's work is the Montreal Protocol, a treaty that most nations in the world are signatories to, including the United States, he said. Through that treaty, industrialized nations agreed to cease production of ozone depleting chemicals in the early 1990s. However, some developing countries like China were given until 2010 to stop making those chemicals, said Wickham. That's where Wickham comes in. China, in exchange for funds from the World Bank to retool the industries and retrain workers that produced the ozone harming chemicals, negotiated a deal with the Montreal Protocol to stop making the substances five years in advance of the 2010 deadline. "My job has been to work with the World Bank in China, with the Chinese Ministry of Public Security, which oversees the fire-protection uses of those chemicals, and the Chinese Environmental Protection Administration, which oversees all the uses of the chemicals, to help companies develop products that are not ozone depleting in nature," Wickham said. Where the ozone layer is damaged, people are more subject to dangerous sunburns and eye damage as a result of overexposure to the sun's ultraviolet rays. For his work with China, Wickham was honored by the U.S. Environmental Protection Agency's Stratospheric Protection Division. The citation presented to him by Drusilla Hufford, head of the division, with the Stratospheric Ozone Protection Award stated: "Mr. Wickham serves as an advisor to the agency of the Chinese government responsible for the halon sector program funded by the World Bank. For many years, he has offered his diverse fire protection experience to the agencies within China responsible for moving from halon use to alternative fire protection technologies. His dedication to ensuring that this transition takes place in a safe and timely manner has produced extraordinary results in a very short period of time. Mr. Wickham's wide experience and focus have been critical factors in the early successes achieved by this ambitious program." The award goes to people who have demonstrated leadership in international technology cooperation, diplomacy, enforcement and identification of substitutes for ozone depleting chemicals, according to the EPA. Wickham said that progress is being made toward preserving the Earth's ozone, but that "the scientists are telling us that as we speak, the ozone is still being damaged by the chemicals produced in the past and by the chemicals still being made in some nations." There is hope, however, that the damage can be reversed. "The best estimate is we're going to reach a point of equilibrium where the ozone layer will no longer be damaged and will start repairing itself at about the year 2020," Wickham said. "We've got the best people in the world working on the problem." A report released last week by scientists studying the ozone said that the damage is likely to be repaired completely by about 2050, later than some earlier estimates, the Associated Press reported. "The most difficult area has been in the Antarctic region, and Australia and New Zealand, where the hole in the ozone is centered", Wickham said. "If you go to Australia, a great business is filling in swimming pools or removing them, because people are so concerned about exposure to the sun due to the ozone layer problem," he said. Wickham said he can't predict how much worse the damage to the ozone layer will be before it gets better. The average person, he said, can make a difference in the meantime. "I think the most important thing is to accept that it is a problem," he said. "Workers in fields such as refrigeration or air-conditioning repair that come in contact with refrigerants that contain ozone-damaging chemicals comply with the handling restrictions", he said, but often grumble about them. "Whenever I run across one of those servicemen, I spend a lot of time explaining to them why it's a problem and how those handling restrictions help." Wickham's work with China is now complete, and these days, he's spending much of his time in Europe on other assignments. In addition to the World Bank, Wickham also serves as a technical adviser to the United Nations Environmental Program and the International Maritime Organization, another UN group based in London. He recently returned from 10 days in South Africa working on international standards and a treaty. 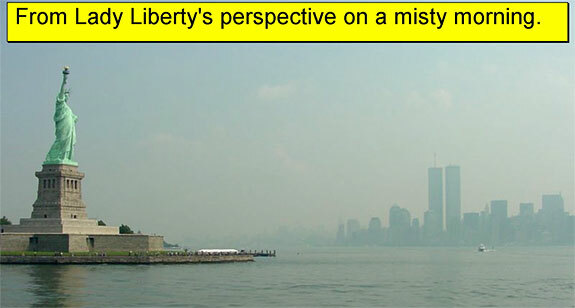 The following article puts the 9/11 outrage in a little different perspective. Gleaned in part from the ST. ANTHONY MESSENGER of September 2003, it was submitted by Paul McCullough '70 who is a frequent contributor. Several pictures are also provided by Paul. McCullough's office building is about one block from the World Trade Center. 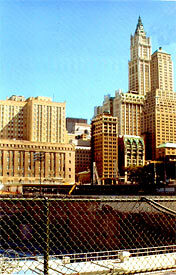 Some of the pictures of ground zero after the cleanup were taken by him, including a view from his office window. Thanks a lot, Pablo. St. Peter's is the oldest Catholic parish in the state of New York. The church's cornerstone was laid in 1785, and the first solemn Mass was celebrated in St. Peter's in 1786. This was nearly three years before George Washington—standing less than a mile away on an open-air balcony of Federal Hall (the nation's first capitol)—took the oath of office as the first president of the United States. The pastor of St. Peter's and other eyewitnesses describe what it was like at Ground Zero on the day the Twin Towers fell—and during the weeks and months that followed. St. Peter's Church in lower Manhattan once stood in the shadows of the Twin Towers of the World Trade Center. So did the parish's mission chapel, St. Joseph's Chapel, a few blocks away—on the other side (southwest) of the Center. Although the towers and other buildings were destroyed on September 11, 2001, the two churches escaped serious direct damage and are now back in full service. Both of these churches, of course, were strongly affected by the 9/11 disasters and were directly involved in rescue activities for some weeks and months to follow. A landing gear from an airplane struck the roof of St. Peter's. The body of Father Mychal Judge, the Franciscan fire chaplain killed by falling debris in the lobby of the North Tower, was carried into St. Peter's Church and reverently placed before the altar. The pastor of St. Peter's himself, Father Kevin Madigan, narrowly escaped death when he hurried out toward the flaming towers to see if he could be of help. Around 9 a.m. on September 11, Father Kevin Madigan heard the parish secretary screaming. Patricia Ruggiero felt the whole building shake violently, ran out onto Barclay Street and looked up to the top of the North Tower, 110 stories above her. She saw the flames, the smoke and a gaping hole. She ran back, shouting to Father Madigan that a plane had hit the tower. "I looked out the window," Father Madigan says, "and I saw all kinds of fire engines and ambulances. Sirens were wailing. I hurried down the street toward the World Trade Center and saw everything on fire. I was trying to find out from the cops where they were carrying the wounded. All of a sudden, as I stood there, there was another explosion. 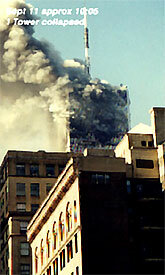 The second plane was hitting the South Tower. Debris went flying all over the place. I remember seeing a wheel of the plane fly over my head. And some kind of water broke above me and splashed on my shoulders." Father Madigan returned to St. Peter's Church to make sure the staff got out safely and could get back to their homes. Then he went back outside. On the street, he met a priest who was an assistant fire chaplain and went along with him. 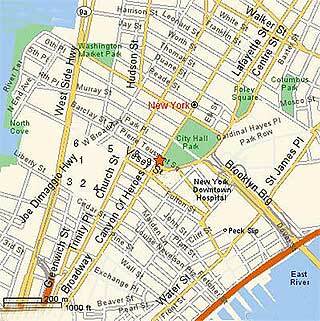 "He and I were walking south on Church Street, which is the eastern boundary of the World Trade Center. "All of a sudden we heard this BIG RUMBLE! 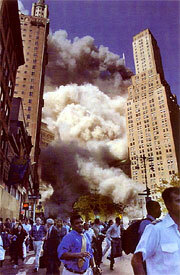 The South Tower was collapsing first, even though it was the second tower hit. 'Go down here!' I yelled to the priest, pointing to the stairs leading into a subway station. I figured that if we could get down into the station and nothing collapsed on us, we could walk along the subway platform and emerge about four blocks north of the World Trade Center. Transit cops were also nearby and they ran down the steps behind us. 'Huddle against the wall!' they shouted. We huddled there for about 15 minutes. Dust came pouring in and we began choking. The dust finally settled. We all linked arms. One of the cops had a flashlight so we just walked along the subway platform and emerged again into the open air after about four blocks." Father Madigan is still counting his blessings. If he and the fire chaplain had been walking a block or two farther down Church Street, he believes the falling debris of the collapsing tower might well have killed them. Around the same time that Father Madigan and his group were huddled against the subway wall, Franciscan firefighter chaplain Father Mychal Judge was struck on the head and killed by a piece of falling debris in the lobby of the North Tower. Having been informed an hour or so earlier that a plane had struck the tower, the Franciscan friar rushed to the World Trade Center to assist his fellow firefighters and to pray with the wounded. Also inside the North Tower lobby at the time was Bill Cosgrove, a 49 year old police lieutenant assigned to traffic. He too had driven quickly to the World Trade Center, parked his car next to St. Peter's Church and had run over to the North Tower. Cosgrove, now retired, explained in a phone conversation how he happened to be one of the men who carried the body of Father Judge out of the rubble. The North Tower was in a state of "complete chaos," he recalls. "I'm running back and forth from the lobby to West Street, coordinating ambulances for the injured. The last time I enter the lobby, I notice a fire command post and I see Father Judge standing there. He is still alive and behind the fire desk with the fire chiefs. "But, suddenly, all the lights go out and everything begins shaking. Although it is really the South Tower that is collapsing, we think our building is coming down! I begin choking from the thick clouds of cement dust drifting in. I'm barely able to breathe. Before long, as I'm reaching around in the darkness, I see the fire chief shine a light on the face of Father Judge. 'Oh my God, it's Father Judge!' he cries." Lt. Cosgrove and several others pick up the dead fire chaplain and find a way out of the building. When the five men carrying the priest's body are about 30 yards away from the North Tower and heading east on Vesey Street, New York Times photographer Shannon Stapleton snaps the famous photo seen around the world of the group anxiously transporting the lifeless body through the dust and rubble. Shortly after this, they transfer Father Judge to a body board and carry him to the corner of Vesey and Church Streets, where there is an ambulance already filled with injured people. "We place him on the ground next to the ambulance and try to catch our breath," says Cosgrove. At this point, the body of Mychal Judge is lying less than a half block from St. Peter's, located at the corner of Church and Barclay Streets. Because a priest could not be found to bless the body or offer final prayers, Cosgrove and another policeman, Jose Rodriguez, knelt down alongside the body and prayed for the slain priest. "We removed the jacket that was covering his head. Father Judge looked peaceful," remembers Cosgrove, "like he was asleep. We knelt on the ground, placed our hands on his head and said our own personal prayers for him. Then we blessed ourselves and placed the jacket back over his head." And that was the last time Cosgrove saw Father Judge's body that day. When he went into a nearby deli in search of water, he got trapped inside with others because the North Tower suddenly began coming down with an enormous roar. Fallen debris at first prevented those inside from leaving the building. When they finally broke out, Cosgrove was needed to help lead the others to safety. He had no opportunity to check back on the fire chaplain's body. In the meantime, another fire chaplain, Father Kevin M. Smith, pastor of St. Francis de Sales Church in Patchogue, New York, was just a block or two away. He got word that his fellow fire chaplain Mychal Judge had been killed and was asked to bless the body. In time Father Smith was able to locate the body, now partly covered by rubble, and bless it. Soon he was accompanying a group of people carrying the body to a command station just a half block past St. Peter's Church (at 99 Church Street), where the body was officially identified. The police and Father Smith looked at the body and saw Father Judge's firefighter's badge and other identification. The body was then released. "I saw four firemen outside the building," says Father Smith, "and asked them to carry the body to St. Peter's." He felt it was very appropriate that the body of a priest and of a fellow fire chaplain he had come to know be placed inside the church. Father Smith accompanied the body into the church and suggested that it be laid out on the marble floor before the altar. He then went into the sacristy and found a stole, which he placed on top of Father Judge's body along with his fireman's badge. Father Donald Fussner, an assistant pastor at St. Peter's, was in the church when the firemen brought the body of Mychal Judge up the center aisle and placed it before the altar. Father Fussner says that he had noticed "that Father Judge's neck was swollen and appeared to be broken. His head was lying totally on his shoulder." He also mentions that firemen had pulled forward the two large candles that stood on either side of the altar so that one stood on either side of Father Judge's body, during the hour or two that the body reposed there. 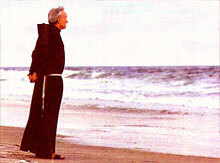 Father Judge overlooking the Atlantic off Long Is-land, shortly after the TWA Flight 800 accident - summer, 1996. A Franciscan friar in New York and a good friend of Father Judge has pointed out a curious coincidence or connection between Father Judge's body lying on the marble floor before the altar and a marble image, or bas-relief, of Christ on the front of the church's old altar only four or five yards away. The marble image of Christ shows Jesus' body as it lay in the tomb (on the day of his crucifixion). According to Father Madigan, the bas-relief had come from the original (1786) St. Peter's Church. Father Judge's body remained before the altar of St. Peter's until around 2 p.m., when two Franciscan friars from Father Judge's residence, St. Francis friary on West 31st Street, came to St. Peter's to take the body of their confrere back to the fire station across the street from the friary. The Church of St. Peter was only slightly damaged by the collapse of the towers of the World Trade Center, whose northeast corner is only a half block away from the church. The worst harm came from the piece of landing gear that struck the church's roof and left a large hole. Water damage also occurred, however, when ash and debris from the two towers caused the gutters to back up during a heavy rain a few nights after the tragedy. Other damage came from the wear and tear of rescue operations based at St. Peter's Church after 9/11. "We were the first place they were bringing all the emergency equipment. Everything was in disarray," Father Madigan says. "Stuff was piled six feet high all over the pews—bandages, gas masks, boots, hoses and cans of food for the workers and the volunteers, many of whom were sleeping in the church on bedrolls." The same was true of the downstairs church, he adds. Normal life did not come back to St. Peter's until October 28, when martial law in the area was lifted. "That was when we officially celebrated our first Mass after September 11," says Father Madigan. There were other Masses before then, but only for the rescue workers and those with credentials to get in. After October 28 the parish cut back on the number of Masses "because the number of people coming was way down. Many who had been coming to Mass at St. Peter's or St. Joseph's from the World Trade Center, of course, were not around anymore." In recent decades both churches had become, for the most part, service churches for people who attended Mass before going to work in the morning or during their lunch breaks. Because these Catholics came and went rather anonymously, it was hard for the parish to know how many had actually perished or been seriously injured. They know of only two registered parishioners who were killed on September 11—one who was a lector at St. Peter's and the other, a parishioner at St. Joseph's. The St. Joseph's Chapel experienced a fate similar to that of St. Peter's after September 11. It too served as a space for rescue efforts and emergency equipment. In Father Madigan's words, "FEMA—the Federal Emergency Management Agency—had gotten into the chapel and just took the whole place over. They had taken out all the pews, as well as the chairs with kneelers attached, and placed them in the plaza in front of the chapel. It rained a couple days afterward and all the wood, fabric and kneelers were destroyed. The carpet was destroyed from all the dust of people coming in and out. The ceiling, too, suffered dust damage from the impact of the collapsing towers. "For about two months after FEMA left," Father Madigan adds, "we let the city use the chapel space as a place where construction workers, cops and firefighters could go and eat and take a break. Computers were set up so rescue workers could receive and send email." It was another way for the parish to continue serving the rescue efforts, according to the pastor. Father Madigan and other parish leaders decided that St. Joseph's Chapel needed to be completely redesigned and renovated before it could open again. 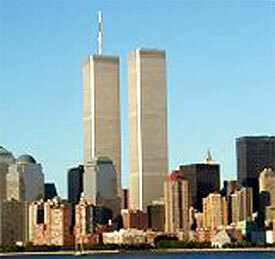 The official reopening took place on the first anniversary of the disaster, September 11, 2002. Both St. Peter's Church and St. Joseph's Chapel will mark the second anniversary of the World Trade Center disaster on the 11th of this month with special Masses and prayers to remember the victims and heroes of 2001. Last year, in his homily on the first anniversary of the terrorist attacks, Father Madigan shared some thoughts that helped the parish of St. Peter's grapple with the immense tragedy of 2001. His words are helpful to all of us. 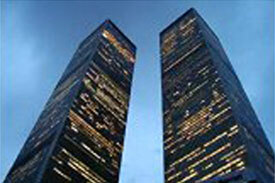 "On September 11 the world as we used to know it fell apart. But at the same time we witnessed a terrible act of evil, we also saw incredible goodness, compassion and bravery. As the Twin Towers were being consumed in flames, people were rushing from all over the city to be of help—police officers, EMS workers, firefighters. But there were others, ordinary people who acted heroically that day—office workers who delayed their own escape to stop and assist others ....incredible goodness in the face of terrible evil. Prior to September 11 we were accustomed to look at the Twin Towers as the symbol of America's strength and power in the world of trade, commerce and finance. But as those buildings turned to dust before our eyes, we came to look to each other to see where our true strength and power lie. Our true strength was in all those acts of compassion, those deeds of generosity and self-sacrifice that were performed that day and in the days, weeks and months afterward." • St. Peter's Parish opened the first Catholic school in the state of New York in 1800. • Elizabeth Ann Seton was received into the Roman Catholic Church at St. Peter's in 1805. 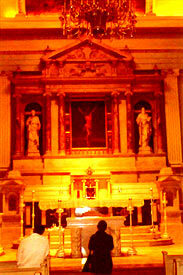 Born in New York City in 1774, Elizabeth often prayed before The Crucifixion painting above St. Peter's main altar. (This painting by Mexican artist Jose Vallejo was a gift from the archbishop of Mexico City in 1789.) A widow and mother of five, the former Episcopalian eventually went on to found the Sisters of Charity. Elizabeth was the first person born in the (soon-to-be) United States to become a canonized saint (September 14, 1975). • Pierre Toussaint was a well-known parishioner of St. Peter's for 66 years. Toussaint (1766-1853) was born a black slave in the Caribbean land now known as Haiti. Brought to New York as a slave and educated by the wealthy Berard family, he was eventually given his freedom. He became a prominent New York hairdresser, businessman and exemplary Catholic, always showing great generosity to the poor. Cardinal John J. O'Connor introduced Toussaint's cause for beatification in 1990, and Pope John Paul II declared him venerable in 1997. His body is now buried in the crypt of New York's St. Patrick's Cathedral. • Father Edward F. Sorin, C.S.C., founder of the University of Notre Dame, stayed at St. Peter's. Father Sorin and six brothers of the Congregation of Holy Cross arrived in New York from France on September 13, 1841. They celebrated their first Mass in America the next day at St. Peter's on the Feast of the Exaltation of the Holy Cross. They proceeded to Indiana where Father Sorin and companions eventually founded a small school near South Bend, naming it after Our Lady. On the 14th of this month, the Congregation of Holy Cross will place a plaque at St. Peter's commemorating the Congregation's first Mass in this country. • The cornerstone of the present Church of St. Peter was laid in 1836. It became obvious as time passed that a new, larger church was needed to accommodate the rapidly growing parish. By the 1940s, however, St. Peter's was becoming more of a service church as the district gave way to stores and tall office buildings, with thousands entering the area each day for work. The small mission chapel of St. Joseph's opened its doors in 1983. Father Kevin Madigan and a committee of parish leaders from St. Joseph's Chapel have commissioned Dallas artist John C. Collier to create works of sculpture for a commemorative shrine to be placed in St. Joseph's Chapel later this year. The special memorial or shrine has been designed to honor the heroes of 9/11 for the acts of love and courage they displayed that day, as well as to convey themes of hope and the Resurrection. Collier is currently finishing work on the sculpted images of four saints, who are either patron saints of groups that were involved in the disasters or saints portraying hope and resurrection. The four saints are St. Florian, patron of firefighters; St. Michael, patron saint of police officers; St. Mary Magdalene, the first witness of the Resurrection; and St. Joseph, the patron saint of the Chapel—and of all workers (including the many who died at their work on September 11 or who are actively rebuilding what was destroyed). These four sculptured figures will be placed along the eastern wall of St. Joseph's Chapel, the wall closest to Ground Zero. In his home in Dallas, which also houses his studio, Collier recently spoke to us about his religious background and the themes he has tried to express in the memorial shrine at St. Joseph's. Raised in the Protestant tradition, Collier and his wife, Shirley, currently attend services at Dallas's Episcopal Church of the Incarnation. "I'm halfway to being a Catholic," he says with a smile. "The greatest art in the history of the Western world," he asserts, "has been commissioned by the Catholic Church." Collier took me to two Catholic churches in the Dallas area where his artwork tastefully adorns their sacred spaces. One of Collier's most nationally recognized works is his monumental outdoor sculpture of the Good Shepherd, commissioned by the Roman Catholic Diocese of Greensburg, Pennsylvania. Collier was happy to describe briefly the four saintly figures that will inhabit the memorial shrine. "St. Florian," he says, "is climbing a ladder with a bucket of water. The water is spilling to the ground upon a scallop shell, a symbol of baptism and resurrection. The ladder reminds us," he adds, "that many of the firefighters of 9/11 died on the stairs of the Twin Towers. St. Michael is wrestling with the serpent, forcing the serpent [Satan] into a pit. This suggests that, at the end of time, good wins over evil. St. Michael wrestles with the serpent just as police officers must struggle each day with the forces of evil, even as we all must. St. Mary Magdalene is thought of as the 'first witness of the Resurrection.' She is standing at the tomb holding two jars of spices lovingly in her hands. The spices, which, of course, she did not have to use, become a symbol of the Resurrection. The saint will continue announcing this good news to all who visit the shrine. St. Joseph, holding his tools, is also a symbol of resurrection—of rebuilding what has been destroyed. 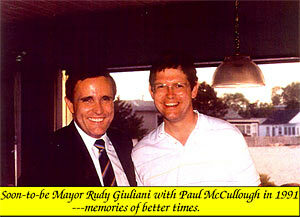 He thus serves as an inspiring patron of all those devoted to the cause of rebuilding what was lost on September 11." John Collier admits that, like many artists, he has fantasized about designing a public memorial at the World Trade Center itself. But he has found a deep joy in fashioning this memorial for a Christian chapel that is very close to Ground Zero. "As grand as any secular memorial might be," he says, "it can only say 'Remember.' But Our Lord offers more. He offers resurrection, which is the hope of the dead. This commission has given me the freedom to say that!" 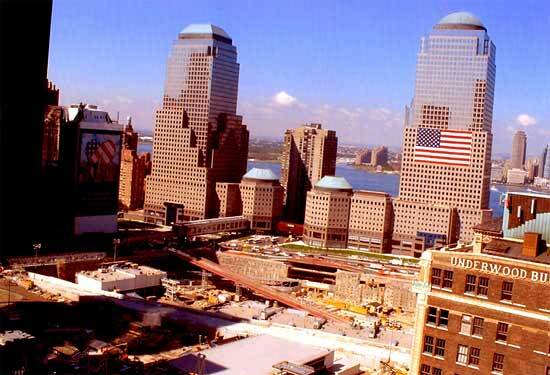 WTC at Austin Tobin Plaza. World Financial Center in background. NOTE THE STEEPLE OF ST. PETER'S CHURCH (LOWER CENTER). he was killed. He remained here until about 2 - 3 pm that afternoon. Since my office is at 225 Broadway (B'way @ Barclay), I went out today to take some pictures to commemorate the anniversary of September 11, 2001. 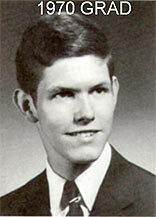 I'm not sure, but I may have the curious distinction of being the Campion person who works closest to "Ground Zero", although there appear to be other Campion alumni (or acquaintances of theirs) who live in the Soho - Tribeca area just north of here, as described at the alumni website for 1965 graduates. I try not to dwell on the New York events of 9/11. 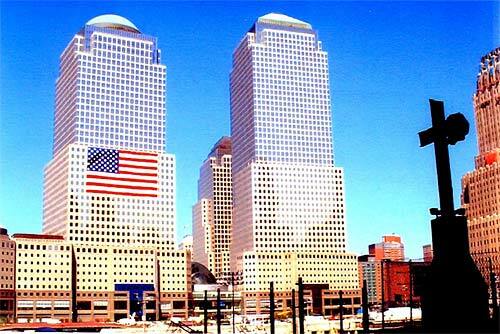 Instead, I have very happy memories of The World Trade Center over the years and I am sure there must be other Campion men in New York City who have happy memories about the complex as well. My sister worked on the 91st floor of the South Tower (2 WTC) from 1975 to 1988 and I visited her frequently, kidding her way back when with "Your building looks like a sleeve of Premium Saltines." The building indeed swayed on windy days and one could hear the elevator cables clanging in the shafts. From her office over the years, I was able to watch the celebrations for American Bicentennial (The Tall Ships, 1976), the Brooklyn Bridge Centennial (1983) and the Statue of Liberty Centennial (1986). Regarding Windows on the World, the restaurant atop 1 WTC, my birthday was celebrated there twice, I took my wife Kathleen there for her birthday the year after we were married, and my father's retirement from The Prudential Insurance Company was celebrated there. I'd have an occasional pop at (talk about hubris) The World's Greatest Bar, the watering hole adjacent to Windows. While working for the New York City Department of Health, I was stationed at the city's Emergency Command Center at 7 WTC (the building that collapsed at 5 PM on 9/11) during the outbreak of West Nile Virus and for Tropical Storm Floyd in 1999. Twice a week, I'd enter and leave NYC through Hoboken via the PATH (Port Authority Trans Hudson) and pass through the shopping center below the towers (the other days I'd enter and leave midtown). 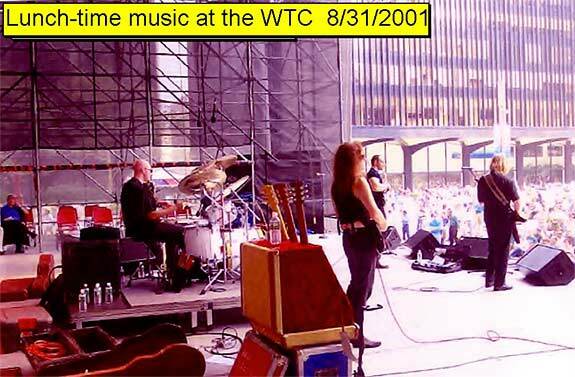 From noon to 1 :30 pm between late June and Labor Day, free live music was performed at the base of the North Tower (1 WTC) with a different style of music each day - cool jazz on Wednesdays, Country and Western Thursdays, Rock and Roll Fridays and Latin / Salza Fridays at 5 pm (muy caliente!). And the artists were big names: Kim Waters. Angela Bofill, The Rippingtons, Frankie Valley and The Four Seasons, to name a few. There would be hundreds, if not thousands, eating and enjoying the music during these events. They were young people, for the most part, all getting their groove on. I guess what I am trying to convey is, that despite their enormous size, 1365 feet (¼ mile!) and their somewhat austere, sterile appearance, the towers and their surroundings really were the heart of lower Manhattan up to 2001. Especially during the summer, the complex bustled with excitement, young people, music, food as well as commerce. I must speak about Fr. 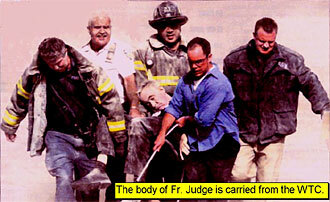 Mychal Judge, FDNY's chaplain, who was killed that day. I knew Fr. Judge as his church, Saint Francis of Assisi, is located at 31st St and 6th Avenue, very near to the place where I work midtown. The enclosed church photo is of the upper chapel of St. Peter's (the oldest R. C. parish in NYC, dating from 1785, Church and Barclay, one block from the WTC and immediately west of 225 Broadway) where firemen brought Fr. Judge's body, laying it before the alter after he was killed. Really a great guy, I knew him over the years, receiving confession from him and schmoozing with him at the St Francis's rectory. His gift to me was how to approach and deal with the homeless. "If you see someone who's living on the street, talk to him, acknowledge him, and, if you can, touch him. Put your hand on his arm or shoulder and show you care. That's all they really want. You'll be amazed what happens." And sometimes, (not always - I have had to run from some crazies) it works - I've gotten some folks into a shelter or rehab, comply with medical treatment, or at least to feel better about themselves when talking to them. So, those are my thoughts this year about 9/11. Commuters returned to the World Trade Center PATH station Monday in an emotional ride along tracks inside Ground Zero. The $323-million temporary station has an industrial feel, with polished metal and exposed concrete. The station is slated to be replaced by 2007 with a permanent structure connected to a new transit hub along Fulton Street. Meanwhile, those who walk through can catch unfiltered views of Ground Zero, but parts of the station are covered with a light mesh featuring inspirational quotations about New York. Situated along the walls are oversized photographs of the city's streetscapes, including one view of the Twin Towers. Security is tight, and the image of revitalization that the station seeks to project is tightly controlled. 1) 1 WTC (north tower); 2) 2 WTC (south tower); 3) 3 WTC (Marriott Hotel); 4) 4 WTC; 5) 5 WTC; 6) 6 WTC (custom house); 7) 7 WTC; 8) St. Peter's Church; 9) 225 Broadway.